The oblique crunch is probably one of the more underused crunch exercises, but it shouldn’t be. 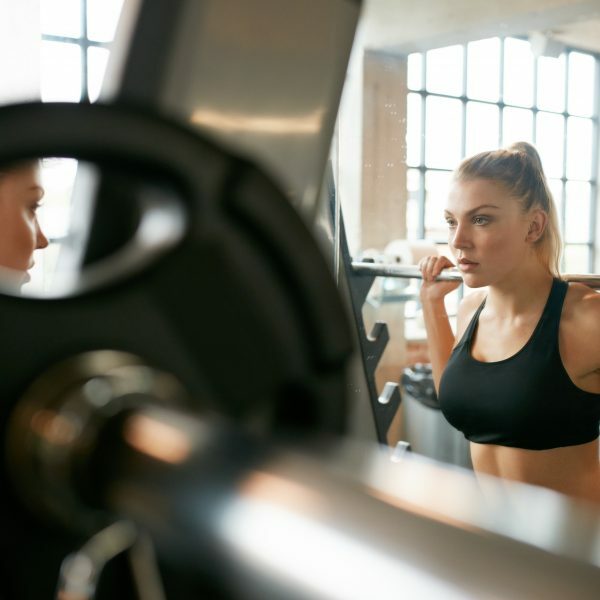 The abdominal wall is comprised of a few specific muscles that all need to be worked if you truly want that six-pack look along with a strong core. That means doing a variation of exercises, including oblique crunches to ensure you hit the muscle from all angles. Abdominal exercises should be performed twice a week. Straight sets or a circuit are both great methods to work the midsection. Ideally you should rotate exercises in and out to keep the routine fresh and varied. Oblique crunches are pretty simple to understand, but not as easy to master. Start by lying flat on your back with knees bent and feet flat on the ground. Now cross your right foot over the left knee and rest your hands behind your back. This is the starting position for one side. From here contract your abs to lift your shoulders off the ground. As you rise slowly twist your upper body to bring your left shoulder towards your right knee. Exhale as you crunch for a tighter contraction and hold for a two-count at the top before slowly reversing the motion. Aim for anywhere from 15 to 25 reps on one side then switch your feet and do crunches to the opposite side. One key is to go slow and in control. This isn’t about counting repetitions; it is about working the muscles. Don’t twist quickly and strain your body just to inflate the numbers; do quality repetitions. Most of the variations on oblique crunches are simple adjustments to the basic position. Twisted Legs – Instead of the foot over your knee position, start with your knees together and feet flat on the ground. Then lean your legs over to the left (or right) and crunch in the opposite direction your leg lean. Cables – Using a rope handle attachment and a high pulley, you can do oblique crunches. Kneel on the floor and hold the rope handles near your shoulders. Crunch forward and down while twisting slightly aiming the right shoulder towards the left knee. Alternate the twists each repetition. Swiss Ball – This is the same as a standard except that you are sitting on a Swiss Ball with feet on the ground and twist as you rise up without aiming at a specific object. Twisted Legs with Kick – Just like the twisted leg version, but as you crunch up, bring up the knee of the top leg to crunch the lower abdominals as well. The use of oblique crunches is important in your abdominal routine if you truly want a well-developed and balanced mid-section. Muscles need to be worked from a variety of angles for complete development and using a standard oblique movement or a variation will ensure that you cover all the angels when working the abs.